Central to the CEC’s aims are creating opportunities to increase awareness and understanding of environmental health research, and for multi-directional dialogue between M-LEEaD Center researchers, community members and policy makers. Some of our recent CEC activities are highlighted below, illustrating our multi-faceted environmental health promotion efforts. Description: This event provided an opportunity for legislators and their staff to meet with environmental health researchers to discuss how Michigan can prevent and more effectively respond to future environmental contaminations. The curriculum was developed by the Community Engagement Cores of the University of Michigan Lifestage Environmental Exposures and Disease Center and the University of California-Davis Environmental Health Sciences Center. The goal of the curriculum is to strengthen the capacity among community leaders in environmental justice movements and academic researchers to develop collaborative, equitable and effective partnerships to promote mutual learning and address environmental issues in communities. 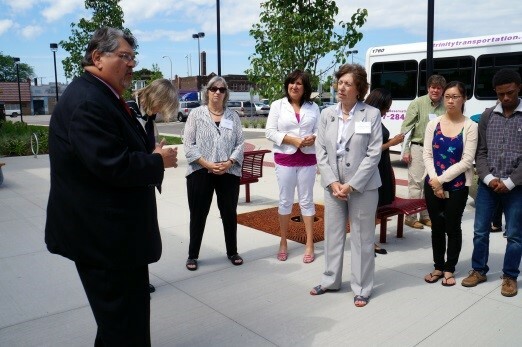 Ricardo Guzman, CEO of Community Health and Social Services (CHASS) Center, Inc, discusses public health in Detroit outside CHASS offices while Linda Birnbaum, NIEHS Director, Angela Reyes, Founder and Executive Director of Detroit Hispanic Development Corporation (DHDC), and Barbara Israel, CEC Co-Leader, along with other tour participants, look on. Photo courtesy of Rachel L. McDuffie. On June 18, 2013, the M-LEEAD Center and the CEC hosted Linda Birnbaum, Director of the NIEHS, at a Community Forum on the topic of air pollution. Invited panelists included Michelle Martinez, Public Policy Associate, Consortium of Hispanic Agencies; Pamela Smith, Owner/Managing Partner, Regeneration LLC; Rhonda Anderson, EJ Organizer, Sierra Club; Stuart Batterman, Professor Environmental Health Sciences School of Public Health and M-LEEAD Center Member; and Wilhemina McLemore, Detroit District Supervisor, Michigan Department of Environmental Quality. For an informative article on the 2013 Detroit Community Forum, please visit the NIEHS Environmental Factor Newsletter. The NIEHS sponsors Community Forums in cities throughout the United States on the general theme of environmental impacts on human health. For a review of past community forums, visit the NIEHS website. For an article on a past forum, please visit the NIEHS Environmental Factor Newsletter. The purpose of the community forums is to bring together members of the public who are interested in public health and the environment with NIEHS and other federal, state, and local government health officials; environmental health professionals; and disease and environmental advocacy groups. The forums provide a platform for open dialogue to establish better coordination among the public and health professionals working on community exposures, industrial exposures, and other environmental issues. These forums also provide an opportunity to promote local and state media coverage of environmental health issues to broaden public understanding. Community forums are neutral, non-partisan events, where all panelists are viewed as experts on best-practices not advocates for a cause. Ricardo Guzman leads Dr. Birnbaum and others on a tour of CHASS offices in Southwest Detroit. Photo courtesy of Rachel L. McDuffie. Project Coordinator Myra Tetteh prepares an electronic presentation for the Community Forum. Photo courtesy of Rachel L. McDuffie. M-LEEAD Center scientist Dr. Stuart Batterman and Dr. Andrew Maynard discuss public health in Detroit at the Community Forum. Photo courtesy of Rachel L. McDuffie. Dr. Linda Birnbaum poses with two attendees at the Community Forum. Photo courtesy of Rachel L. McDuffie. Dr. Amy Schulz, CEC Leader, introduces the panelists at the Community Forum. Photo courtesy of Rachel L. McDuffie. Dr. Birnbaum leans forward to take a question from the audience. Photo courtesy of John Schelp. Abstract: The goal of this project is to conduct an interdisciplinary assessment of potential public health impacts associated with the Detroit Blight Elimination Project. By partnering with the University of Michigan School of Public Health Lifestage Environmental Exposure & Disease Center’s Exposure Assessment and Community Outreach & Engagement Core, the initial epidemiological analyses of current environmental, health and behavioral data collected in Detroit during and after demolition phases will serve to inform community engagement projects and future environmental exposure assessment studies in this vulnerable urban population. The study team, two of whom are employed by the City of Detroit, has been able to access and develop databases and data streams to address these objectives: 1) respond acutely to public health questions and concerns posed by city agencies during the current and future blight elimination activities; 2) share health outcome information with community and academic partners to actively inform ongoing public health efforts and demolition activities; and, 3) engage public health graduate students who can expand capacity necessary for epidemiologic analyses. While environmental assessments of exposures will be limited during this pilot phase, epidemiologic analyses will be used to assess impacts upon particular vulnerable populations (e.g. young, elderly, chronically ill) in line with Center’s theme of Lifestage Exposure and Adult Disease and will greatly contribute to the development of future long-term studies. 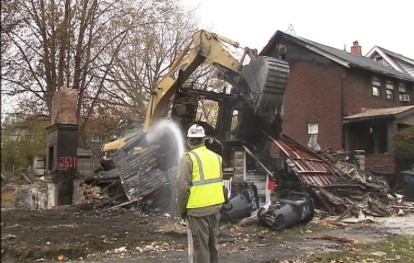 Demolition in the city of Detroit has significant public health impacts . The CEC has facilitated a fruitful relationship between Green Door Initiative and THDAP leaders to involve community members in data collection, resulting in a multi-directional collaboration in accordance with the CEC’s aims. View other Center funded pilot projects here. 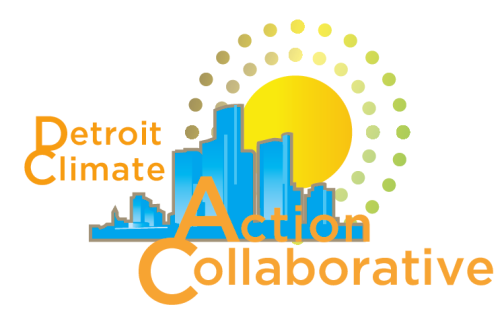 The CEC Project Coordinator, Sharon Sand, serves on the Public Health Workgroup of the Detroit Climate Action Collaborative (DCAC), an initiative of Detroiters Working for Environmental Justice (DWEJ). This group includes representatives from environmental, community, governmental, scientific, academic, health, business and other sectors. DCAC was established to help the City of Detroit identify short- and long-term actions to reduce greenhouse gas (GHG) emissions, provide expert advice on the most credible, aggressive and economically viable targets, develop a comprehensive Climate Action Plan, and to ready Detroiters for coping with the impacts of climate change.